KUALA LUMPUR: If you spot a man stopping traffic with “Stop! Tapir is crossing the road” in Bukit Bintang or KLCC, do not be alarmed. 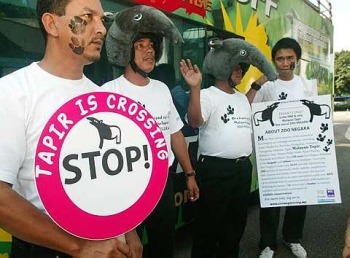 Rest assured, no tapir will be crossing the road; the man is a volunteer who will be at the nearest zebra crossing distributing flyers with information on the endangered species during a four-day campaign organised by Zoo Negara and KL Hop On Hop Off. The volunteers will also be at Menara Hap Seng, Central Market, Chinatown and KL Sentral. The campaign, which started yesterday, is in conjunction with World Tapir Day celebrated worldwide on April 27. Environmental cause: Activists promoting public awareness on tapirs in Kuala Lumpur yesterday ahead of World Tapir Day next Monday. According to Malaysian Zoological Society director Dr Mohamad Ngah, there are four species of tapir left on the planet, including local species tapirus indicus or its common name Malayan Tapir. “The tapir is often overlooked because of its more ‘high-profile’ peers like the orang utan or the tiger, yet all these animals are equally important,” he said at the launch of the campaign at Zoo Negara yesterday. Other “attractions” by volunteers include tapir mascots and a man sporting a sandwich board with relevant information on the species. One flyer will entitle an individual to a RM2 discount for a Zoo Negara entrance ticket if the ticket is bought on KL Hop On Hop Off buses on Sunday. The ticket enables the person to take the bus at the Bintang Walk bus stop next to the Lot 10 Shopping Complex at 11am on the same day. The buses will then ferry the passengers to the zoo for a World Tapir Day celebration. Dr Mohamad said tapir-related activities have been lined up for visitors on the day including art exhibitions, a puppet show and “Tapir & You” 3D photography. KL Hop On Hop Off managing director Syed Azhar Syed Nazir said that beginning April 18 until May 18, a ringgit off each bus ticket sold would be donated to the Zoo Negara Tapir Fund.